IS THIS TRUE, SIR LAURENCE? New claims that Sir Laurence Gardner is a shape-shifter who takes part in human sacrifice rituals. Major revelations about the reptilian presence on this planet. Many people were understandably shocked and skeptical when Arizona Wilder claimed in the video, Revelations of a Mother Goddess, that Sir Laurence Gardner, the author and head of the ancient Royal Court of the Dragon Sovereignty, was a shape-shifting reptilian who took part in Satanic human sacrifice rituals she had witnessed. Nexus Magazine, and its publisher, Duncan Roads, have been particularly scathing of these claims. Hardly surprising, when Sir Laurence Gardner has been massively promoted by Roads and his magazine. But now the author and lecturer, Stewart Swerdlow, says that he also witnessed human sacrifice and blood drinking rituals at the Montauk mind control centre on Long Island, New York, in which Sir Laurence Gardner played a major role. Swerdlow is the author of five books, The Montauk Project: The Alien Connection; The Healers Handbook; As You Sow, So You Shall Reap; Healing of the Mind; and The White Owl Legend. He says he was a victim of the now extensively documented mind control operation at Montauk Point from the age of 14 in the early seventies. He was one of the so-called "Montauk Boys". He has never named names before, but has now chosen to talk to me about his experience of Sir Laurence, who has gained fame in recent years on the New Age and Holy Grail "circuit" for his books claiming that the Merovingian bloodline is the bloodline of Jesus. His best known works are Bloodlines of the Holy Grail and the Genesis of the Grail Kings: The Explosive Story of Genetic Cloning and the Ancient Bloodline of Jesus. I have most strongly contended in my own books and talks that this claim about the bloodline of "Jesus" is a diversion from the fact that the "Holy Grail" or Merovingian bloodline is a key reptilian bloodline from which vast numbers of people in royal, political, economic, religious, and military power today, genetically descend. It is the desire to maintain this reptilian genetic structure which has led to the obsessive interbreeding for aeons to the present day of the "elite" families. Sir Laurence himself calls these "Holy Grail" bloodlines the "dragon" bloodlines, but claims that this term derives from the use of crocodile fat in the royal ceremonies of ancient Egypt. I would contend that the word "dragon" has a much more fundamental meaning than that. These bloodlines, which have invariably ended up in the positions of power since pre-history, have a much more dominant reptilian genetic code which has resulted from interbreeding thousands of years ago between a reptilian race (the "Serpent" race of endless legend) and the mammal-dominated bloodlines which we call "human". Sir Laurence claims that the dragon bloodline, which he connects to the House of Stewart, has the right to the British throne and indeed that these bloodlines have the right to rule in general. According to him the senior legitimate descendant in this line is HRH Prince Michael Stewart, Count of Albany, although the background to this guy is being increasingly questioned and there are claims that he has invented the title. In my view it is classic disinformation or what I call gin and tonic with a twist. A great deal of truth, spun with the idea that these dragon bloodlines are not literally reptilian and are, instead, the genetic stream of Jesus and Mary Magdalene. In an article in Nexus Magazine, he acknowledges that ancient legends said these lines were literally shape-shifting reptilians, but in an obvious swipe at The Biggest Secret, he says that it is astonishing in these more enlightened times that anyone can still believe it. Sorry, Sir Laurence, the evidence will overwhelm you and is already beginning to do so. 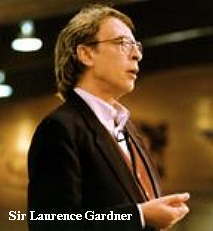 Laurence Gardner has quite a CV: Chancellor of the Royal Court of the Dragon Sovereignty, which first emerged in Egypt in around 2,200BC and is now based in Britain; Prior of the Celtic Church's Sacred Kindred of St Columba, and an "internationally known sovereign and chivalric genealogist" Chevalier Labhran de Saint Germain, "Presidential Attache to the European Council of Princes - a constitutional advisory body established in 1946" formally attached to the Noble Household Guard of the Royal House of Stewart, founded at St German-enLaye in 1692, and is the Jacobite Historiographer Royal.
" When I was at Montauk between 1970 and 1983, I started out there at a very low level. I was not supposed to survive. It was only later when they saw that I was living when I shouldn't have been that they told me that less than one per cent of the experimented children survived. And of that one per cent very few made it into society. Not that I claim to function well in society, because I really don't, but, however, I am doing better than other people are as far as survivors are concerned. And you should understand that the ceremonies that were conducted at Montauk were very occasional. In other words they would occur at certain times of the year. And they would bring in people that were not usually there, one of whom was William F. Buckley, and one of the other ones was someone who I didn't know his name. We didn't know the names, usually. It wasn't until years later that I saw a picture of Gardner and I realised it was him. It was quite a shock to me that here was this man who performed heinous ceremonies with me and there he was on this video I was watching, which, by the way, was made by Duncan Roads (a Nexus video). This was quite a shock to me. He was promoting as the "truth" the bloodline of the Holy Grail and the Jesus connection and all that stuff which is all diversion. All religion is artificial. In the ceremony they would have sacrifices and during the bloodletting, especially if there were infants involved, these beings would change into a reptilian form. And the interesting thing about it is that there would be this yellow-green slime residue after the ceremonies. It would be on my body and on the altars and on the flooring. I have also since found it on my children as well, which is disturbing to me. During the ceremony Gardner would be the one that would actually take over from the Mother Goddess. There was also a male counterpart to the Mother Goddess and he (Gardner) would actually take a blade from the male figure and he would plunge it into the infants body. And then he would, having shifted into reptilian form, he would devour the intestinal body of the infant. To be quite honest I hate remembering these things. They are very disturbing to me. To this day I can't be around blood or anything reptilian. The blood sacrifice is very, very, disturbing to me. My memory of that person (Gardner) started in about 1973 and went to 1980. It happened about three times a year that I would see him at the Montauk rituals. His face was the same, but his hair was darker and he was a bit thinner than he looks now. I remember his face and the attitude...he has very powerful eyes and that is what I would focus on during the ceremony, was the eyes. And that is how some of the energy was transferred between us and them. Gardner would come in with a lot of pomp and ceremony. He would wear a kind of purple-violet robe and was naked underneath it. And then soon as he would shape-shift, the robe would come off and they placed a gold crown on his head. And the crown had what looked like an amber and a ruby, alternate stones all the way around. 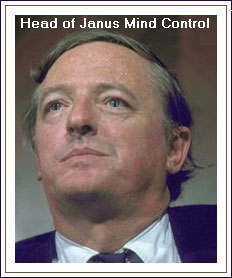 William F. Buckley Jr. (the American publisher who heads the elite Janus mind control project at NATO headquarters) was the most awful of all of them. Quite honestly he used his teeth a lot. He used to bite a lot. He got pleasure out of hurting people by biting them after he shape-shifted. To this very day I have an aversion to that kind of thing. In his shape-shifted form, Gardner was like a whitish-grey colour and had a very pointed back of his head. His eyes were kind of elongated, but not so reptilian, it was almost like they were a cross between human and reptilian. But dark, like a dark, golden brown. And he was not very tall, he was only about six-foot when he shifted. Buckley was taller, he was around seven feet when he shifted, and he had a split in his crown, in other words it looked like horns instead of the top of his head. And he was rounder, more of a greenish white colour. You see we were indoctrinated a lot at Montauk. We were told that there were seven levels of the reptilian race and the heirarchy of them were very similar to the Hindu caste system. So there were accordingly different shapes that occurred. The lower levels never really shifted, they were the little worker drones, if you want to call it that. The top of the line, the Brahmin-type, were very tall and winged (the Draco I talk about in the Biggest Secret and Credo Mutwa describes in The Reptilian Agenda videos). There are locked sequences and open sequences in DNA. Open sequences manifest physically as a characteristic. These people have the ability to lock off certain genetic codings while they open others. When that happens there is a literal transformation of the cellular structure, which changes from a mammalian to a reptilian form. So it's not like the human form goes anywhere, it just shifts, it changes into a reptilian form because those sequences are opened. They also have the ability to shift it back. But they do need mammalian hormonal levels in order to maintain the human form. Their base-line form is reptilian. (Princess Diana's confidant, Christine Fitzgerald, told me that the House of Windsor wanted to interbreed with Diana's genes because they were in danger of becoming too reptilian in their genetics and would not have been able to maintain a human form for many more generations - see The Biggest Secret) . However, when they do that their psychic abilities are not very strong and that's why they have the ceremonies and why they need a mammalian form with the human harmonics in order to access higher levels of awareness. (This is why people like Arizona Wilder are mind controlled to conduct the ceremonies for them). It is the resonance or the vibration of the blood, which creates an energetic field that they can access. And they get plugged into it. That's why infants and foetuses are so important to them, because it's so energetic and so pure that they can really access the switching from one point to another very easily. The reptilians were the first ones to colonize this planet. That's why they consider it theirs. When this other group, a more human form came and colonized, and there were battles here, the human form actually won on the surface and the reptilians went underground and that's where the rumours of hell and stuff came from. That was about 200,000 years ago. It's not as recent as people think. The original reptilians are coming back, they are here now, and the ones who remained on this planet developed their own little sub-culture, which went against what the overall plan was. And now they're afraid of their own people. There's a lot of scurrying around, if you want to call it that, to protect against the original population that's coming back and there's going to be a gigantic battle on this planet in the next few years. I think there's going to be war and the human-reptilian hybrids that are here are going to defend themselves against the originals, the true-breds. So make of all that what you will. If Sir Laurence Gardner has any reply to what Stewart Swerdlow is saying, please send it to this website and I will make sure that every word is printed with equal prominence. Are "Their" Aliens Among Us? Feel free to post this page URL anywhere!